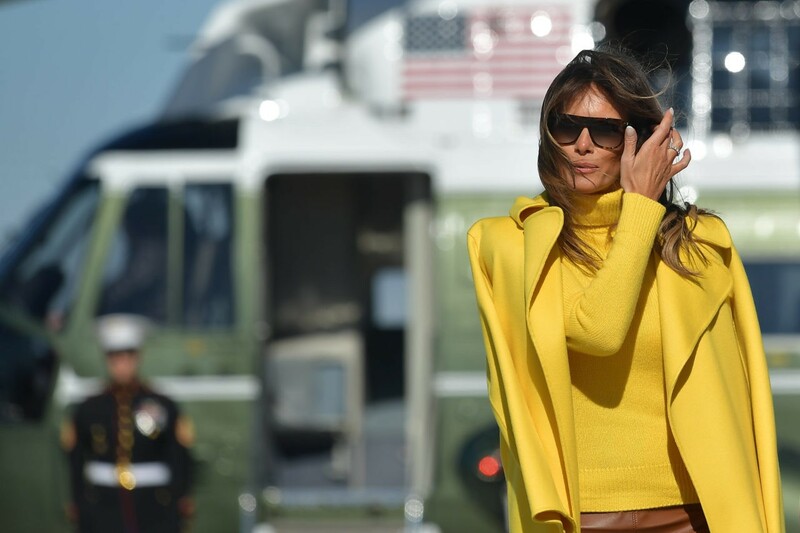 First Lady Melania Trump brought the sunshine to Cincinnati, Ohio when she departed the White House on Monday wearing a bright yellow ensemble with cheetah print stilettos. 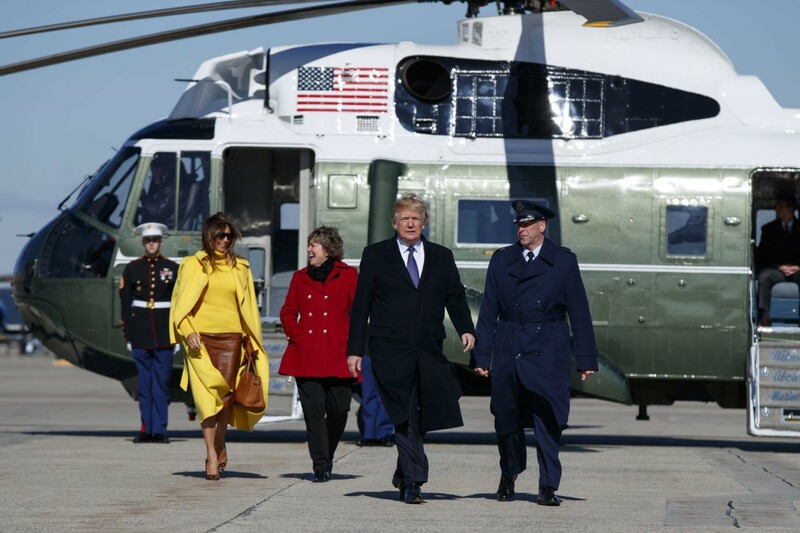 While leaving Washington, D.C. for Cincinnati, Ohio with President Donald Trump, Mrs. Trump was cheerful in a yellow turtleneck with a matching Ralph Lauren jacket, straight off the runway from the brand’s Fall 2017 collection. 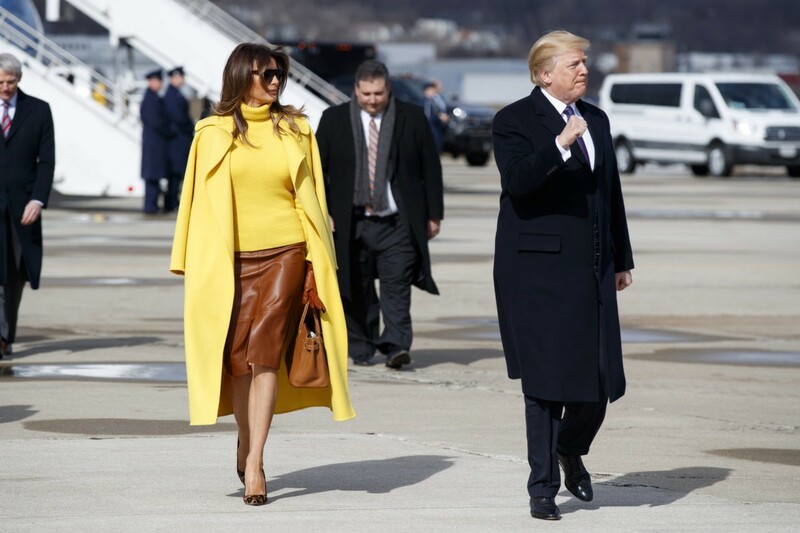 To play off the radiating color — yellow is not typically Melania’s go-to shade — the Slovenian-born First Lady wore one of her favorite Hervé Pierre’s skirts, made of a brown leather with a small slit up the center. Pierre is Melania’s personal couturier and stylist, often collaborating with the designer on looks. Her accessories stayed in the neutrals but were nonetheless luxurious. Melania’s brown leather gloves worn on her hands clutched an Hermès Birkin bag, which could cost anywhere between $20,000 to $25,000. On her feet, Melania stomped to Marine One in these suede cheetah print Manolo Blahnik stilettos, which retail for about $595. On Sunday, for a Super Bowl party at Mar-a-Lago in Palm Beach, Florida, Melania Trump wore her patriotism on her sleeve when she donned an AMIRI red, white, and blue satin-silk varsity jacket and Christian Louboutin blue stilettos, as Breitbart News reported.